The MG Kailis Tropical Rock Lobster business is located in Cairns, North Queensland. It is Australia’s largest producer of Tropical Rock Lobster (Panulirus ornatus). Here, Tropical Rock Lobster are hand-caught by divers. With no pots, nets, traps or baits used, there is no by-catch, which minimises the impact on the marine environment with-in the fishery.The fishery extends north from Cairns all the way to Papua New Guinea. Live Australian and Papua New Guinean lobster is delivered directly from the Cairns export facility to international markets, predominantly Asia. Here, Panulirus ornatus is highly sought after for sashimi-style cuisine thanks to its taste and striking appearance. 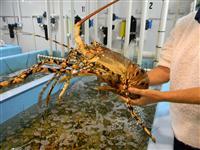 MG Kailis live Austalian Lobster is marketed under the Tropical Star brand and the Papua New Guinean live lobster is marketed under the Warrior Reef Brand. The MG Kailis Group also supplies premium quality frozen North Australian and Papua New Guinean lobster tails and lobster heads to the international market with a major focus on the USA.